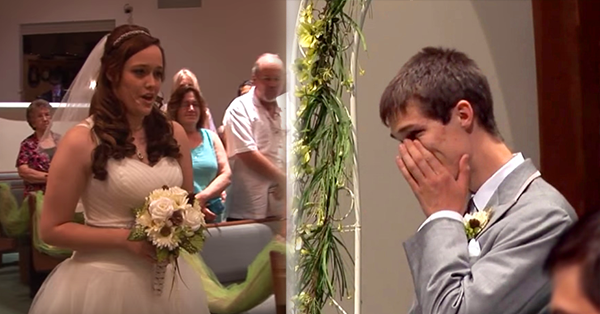 SHOCKING REVELATION: A Bride Made An Unforgettable Moment On Her Wedding Day! Every girl's dream is to walk in the aisle wearing a long white beautiful gown with the man waiting for her in the front of the altar. It is said to be the happiest day of a woman's life. There are a lot of things to consider in preparing a wedding. From clothes of the bride and the groom down to the entourage, food, venue, guest lists etc. A very busy and hectic schedule along the way. But despite of hectic schedule in preparing for the special day, Arianna Pflederer managed to practice a song that she will going to sing on her wedding day. She wanted to surprise her husband to be on their wedding day. Everyone was surprised as the bride walked the aisle of the church. Her husband to be and all the people in the church were teary eyes while she was singing "Look at me" of Carrie Underwood. Watch the video below to see how emotional the groom was, while waiting for his wife to be in front of the altar.